I have the Kindle app on my iPad as well as a “real” Kindle e-reader. While the books I purchase from Amazon stay in sync, I sometimes add books to the two devices that I got somewhere other than Amazon (Project Gutenberg, for example). These books don’t stay in sync. Is there any way to make them behave like Amazon’s ebooks? As some are so fond of saying, “You’re loading it wrong.” It’s like this: Ebooks sold by Amazon are in the Mobi format. These books contain a particular bit of metadata that tells the Kindle reader that page syncing can be carried out with this particular piece of literature. Books that have been converted to Mobi format often lack this metadata. So while you can read them, they won’t sync page information between devices unless you load them in the correct way. The incorrect way is to “sideload” them—meaning copying them from your computer directly to the device as you would if you mounted your Kindle reader as a USB device or added books to the Kindle app on your iPad via iTunes. The way that works is to email these books to your Kindle and iOS device. And Amazon provides a tool for doing exactly that in the form of its Send to Kindle application. Just launch the application and drag any Mobi files you wish to sync into its window. The window will change to show the books you intend to mail as well as a list of Kindle devices registered to your account. 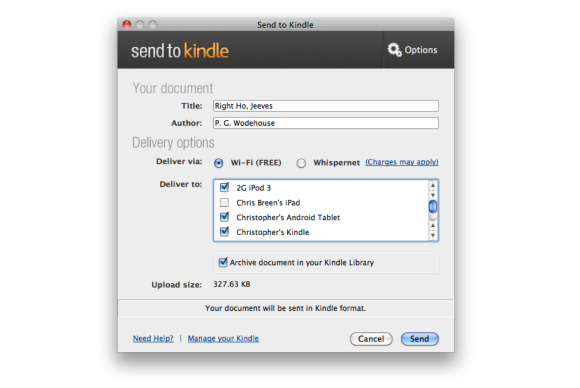 Select the devices you wish to send your books to and click Send. The application will upload your books and, eventually, they’ll appear on the devices you selected. Unlike with sideloaded books, these will stay in sync. Read the first couple of chapters of a book on your Kindle Paperwhite, for example, move back to the Home screen, pick up your iPad, launch its Kindle app, select the same book, and you should see a notice asking if you’d like to move to the highest numbered page read on another of your Kindle devices.